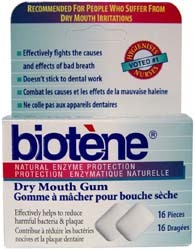 Biotène Dry Mouth Gum will help you stimulate saliva flow and extra protection while away from home. When used daily, the active enzymes in Biotène can be effective in protecting your teeth between brushings. Chew one or two pieces, as required, to relieve dry mouth and throat (especially recommended after meals when unable to brush). Biotène gum does not stick to dental appliances. In inhibits the growth of pathogenic bacteria (because bacteria can not use it to grow and metabolize). Is the Biotène dental chewing gum sugar free? Yes, Biotène gum is sweetened with Xylitol. A natural sweetener that is not a sugar. Biotène gum is excellent for diabetics. Is Glucose Oxidase a sugar? No, Glucose Oxidase is an enzyme. How long can I chew the gum? The gum can be chewed for as long as you like but should be kept in the mouth for at least 3-5 minutes to allow the enzymes to work. Will Biotène gum stick to my dentures? No, Biotène gum will not stick to dentures. Can anyone chew Biotène gum?